There’s nothing like the pride of seeing your own students graduating. Who knew that those empty-headed apprentices would grow to be such sought-after paladins and arquebusiers? Okay, I knew, because that’s how Valthirian Arc: Hero School Story works. Just let me have my sentimental moment. I worked hard to raise my pupils, after all. The concept comes from developers at Agate, who have essentially updated a flash game for PC, PlayStation 4, and Switch. 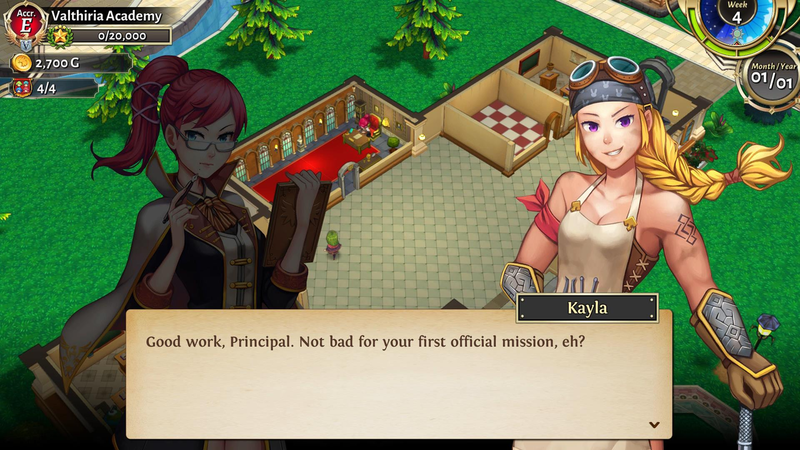 A school management sim crossed with a hack-and-slash RPG was all I needed to hear. I was completely sold by the idea of building classrooms, training students, and teaching them first-hand with real-time combat. The aim of the game isn’t just to have a successful school. Valthirian Arc’s plot centers on the recent passing of the kingdom’s ruler. As headmaster of the local academy, it is, of course, your job to help choose the next monarch. Will you help unite all five queendoms, find preference with one, or perhaps seek out the heir to the throne? Watch out, though. While your little heroes in training are out to protect the kingdom, a group of cultists is desecrating the deceased Queen’s grave for some kind of dark ritual. Intriguing. Unfortunately, while the story does drop-in relatively often, it always manages to feel blasé. It tries to get your attention with political wars, cultists, pirates and princesses. Yet simply involving these topics, without giving them any kind of depth, does not automatically create a good story. Information is parroted out by characters, whose single 2D portraits offer the same stuck on expression no matter what’s happening. Is it so surprising that I can’t feel worried for someone’s life if you’re telling me about it with a smug grin? What’s more, the same three to four extra character pictures are used for all the unimportant NPC. Prepare to help the same boy, knight, and old man under an assortment of different pseudonyms. Maybe Valthirian Arc‘s gameplay will be more satisfying? There are two modes to talk about; the school management, and then the mission-based combat. You get a small handful of different buildings and decorations to put down. I really like how each facility has a direct effect on the combat. 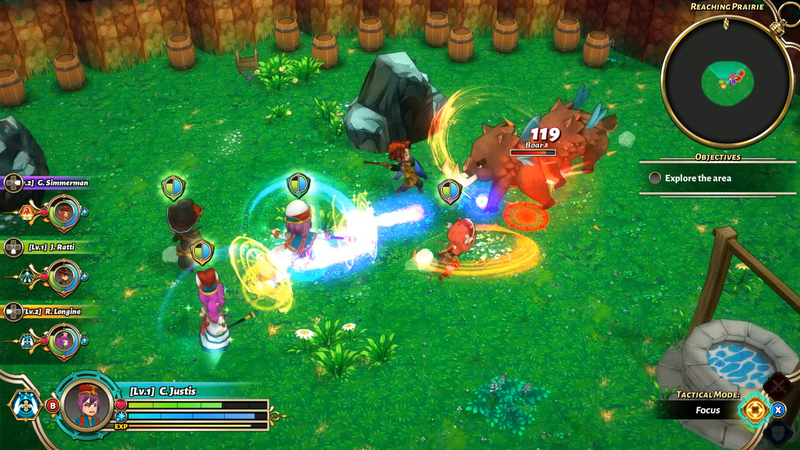 A Knights Quarter, for example, will raise physical attack, while a Scout’s Gauntlet gives more dexterity. Calling this school management, however, is a bit of a stretch. Space slots are so limited that after maxing out the academy, you can’t even have one of everything. 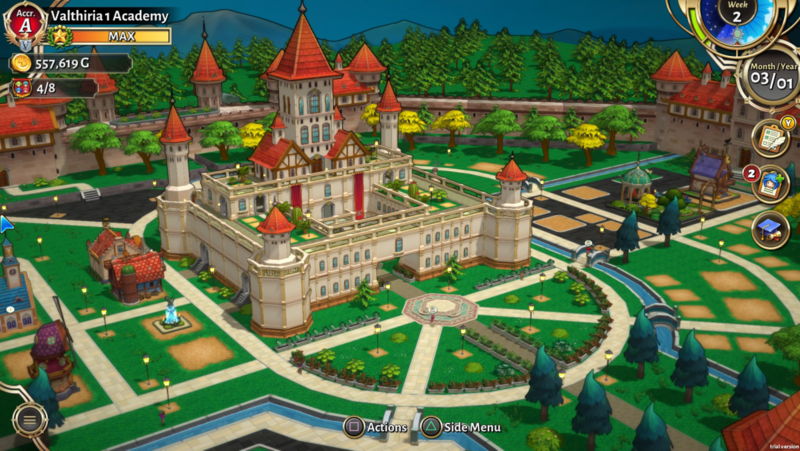 Choosing when to place important buildings is also pretty much done for you. Students can’t learn without the teachers to go with them, thus you’re forced to follow Valthirian Arc’s pacing. I unlocked the theatre for Harlequin’s early on but didn’t get the mentor for a good few hours of gameplay. Instead, the game gave me the Arc Draconus teacher. Guess I’m building the Dragon Cage instead. That’s fine; I just would have liked to make the choice myself. The only real management you get comes from the students themselves. They arrive as apprentices, but at level 10 can be promoted to a Knight, Scout, or Magi. Upon hitting level 10 a second time, pupils can be one of two new tiers. For example, Magi can be Scholarsages or Medicas (magic or healing based). Despite being a very simple class system, the increase in power for each upgrade is surprisingly satisfying. Oh, and I have a soft spot for seeing the characters in all their cute outfits. Just like in school, students must eventually leave. Graduation is held once per semester, and at least 1 pupil must be chosen to leave for the real world. 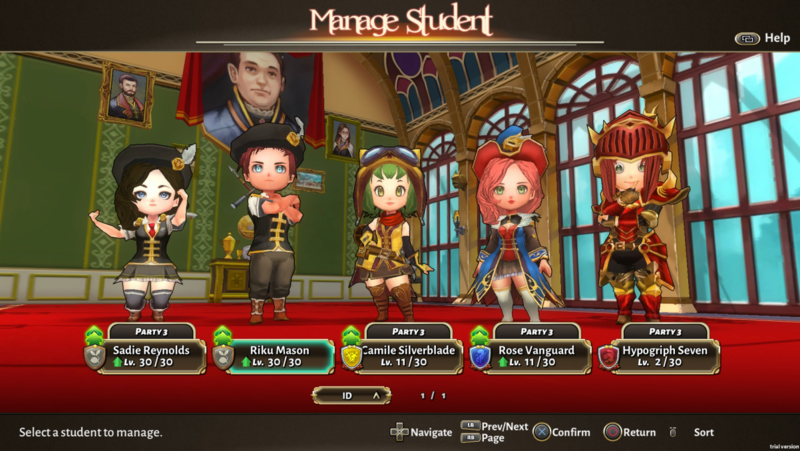 Losing strong party members can mean having to build up a new strong team, but at the benefit of money, prestige, and a free slot for new students. You see, when first opening the academy, students will cap out at level 10, which will only get you so far. So it’s worth swapping things around for those level 20 and 30 prodigies, even if it is sad to see certain pupils go. I hope you find happiness, my cute, gothic paladin friend. When you’re done with the ‘management’ side of things, it’s time for some practical lessons. You can create three teams of four, and choose where to send them from the mission screen. Valthirian Arc divides quests into hunt and errand missions. Going for hunt missions has you controlling a chosen party on the battlefield. Meanwhile, errand missions simply send a team out to fight on their own. Quick word of advice. Do not send all three parties on errand missions at the same time. Accidentally doing this forced me to watch the completion percentage meter slowly rise for around 20 minutes. Okay, I learnt from my mistake and it gave me time to grab a coffee and make some notes. That doesn’t really excuse not having a skip button, though. Speaking of which, hunt missions are easily the best part of Valthirian Arc. Run around the environment and kill the specified number of enemies, pick up the McGuffins, or simply find the exit. Yes, again it’s a repetitive formula, but one that’s easily digestible. Despite samey environments and button mash combat, there’s something fun here. It’s probably the constant amusement of characters loudly proclaiming that a certain beast will be a tough fight, only to have it go down in two hits. Switching between the party of four is done with a press of the d-pad, adding a bit of variety. Don’t expect anything crazy, though. We’re talking the difference in close or long range attacks, and a class-based special move (that takes from your limited stamina supply). To be honest I mostly stuck with my hammer-wielding paladins, only switching when my healer needed encouragement to do their job. Despite its simplicity, Valthirian Arc kept me going. There’s a real feeling of success upon hitting level 10 for the second time and getting that sweet damage boost. Your homework still gets a C though, Valthirian Arc: Hero School Story. Both concept and ideas may be bang on target, with lots of potential for entertainment, yet it’s lacking that extra effort that would have made it special, or even memorable. This review is based on the PlayStation 4 version of the game. A copy was provided by PQube Games.